We are leading manufacturer of Brass Neutral Bar with Base, in Jamnagar. Material: Brass (CuZn39Pb3) & other specified alloys. Finish: Self Color Natural, Nickel plating as required. Number of Tunnels or Poles: 6, 9, 12, 18, 24, 30, 36, 42, 48, 54, 72, 96. Overall length from 72mm upto 996 mm are currently being manufactured at our factory. Length can be increased as specified. Screws: Steel Multi-Head, Zinc plated – Headless set screw, Headed slotted machine screw, Headed machine screw combination & square slot, Headless Hex socket, etc. Numbered as well as Un-numbered bars available on request. Single screw Tunnel as well as Double screw tunnels. Chamfered edges & Tunnel holes. Wire range: American Wire Gauge AWG 4-14 CU (copper wire), 4-12 Al (aluminum wire) 2/0-14, 300MCM-6, Dual Rated, Solid & Stranded, rigid or semi rigid stranding. Amp Rated at 85 Amps for Copper wire and 70 Amps for Aluminum wire. Any kind of customized Bars are can be developed and supplied exactly as per clients Drawings & specifications. 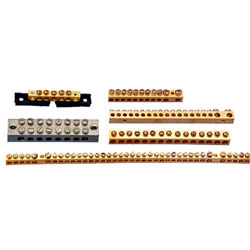 Also available: Custom Earth Bars, Custom Neutral bars, Neutral Bar Mounting Feet, Copper Bus bars, Terminal Blocks, Custom link bars, Switchboard components. We are offering our valued clients an impeccable rang of Neutral Brass Links. Designed to perfection, these links conform to the defined parameters of the industry and prevailing market trends. Furthermore, to cater to the multifarious demands of the clients, we offer these links in different sizes and other specifications. 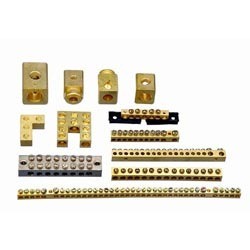 We are offer to the customer this range of Brass Neutral Links that is availed to the customers in terminal blocks of up to 1 metre length. Our firm is also able to provide these in 4 way and 8 way links. We have stringently manufactured these links for all types of panel board, switch gears and electrical switch boards.